Are you an armchair sailor? Or dreaming of floating round the tropics? 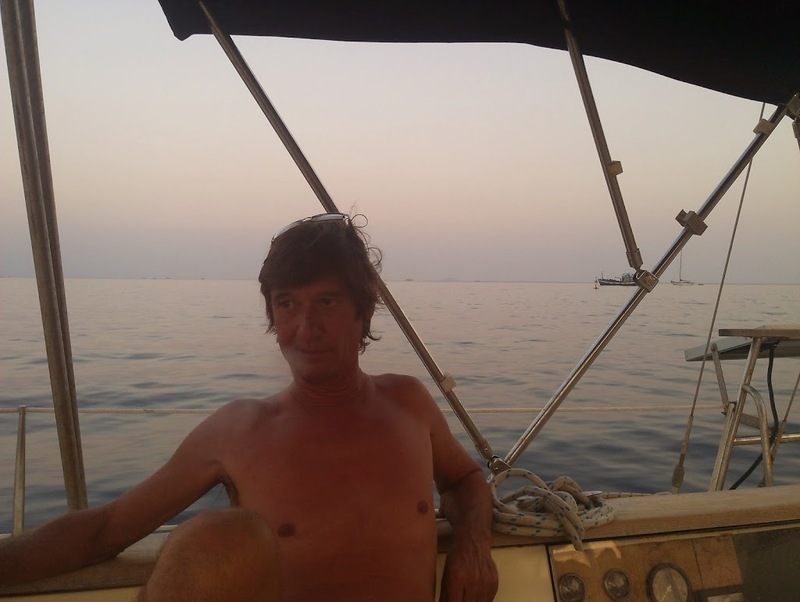 Come cruising with me in these sailing blogs! 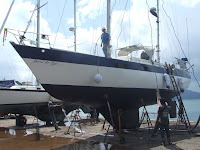 The weather gods were kind to us when we sailed our yacht Yana de Lys south from Langkawi Island to Danga Bay in Johor Bahru . We weren’t hammered by any many sudden storms. We didn’t encounter much wind though, being so close to the Equator. We spent a lot time motoring, rather than actually sailing. 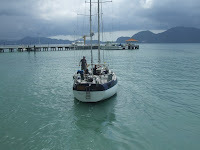 We were in no rush, just day sailing our way down the west coast of Peninsula Malaysia. Our trip was just peachy, the whole way! We made ten stops, mostly deserted anchorages: Pulau Tuba, Monkey Beach and Pulau Rimau (Penang), Sungei Dinding (Lumut) , Pulau Angsa, Che Mat Sin (Port Klang), Admiral Marina (Port Dickson), Pulau Besar, Tanjung Tohor, Pulau Pisang, Danga Bay. 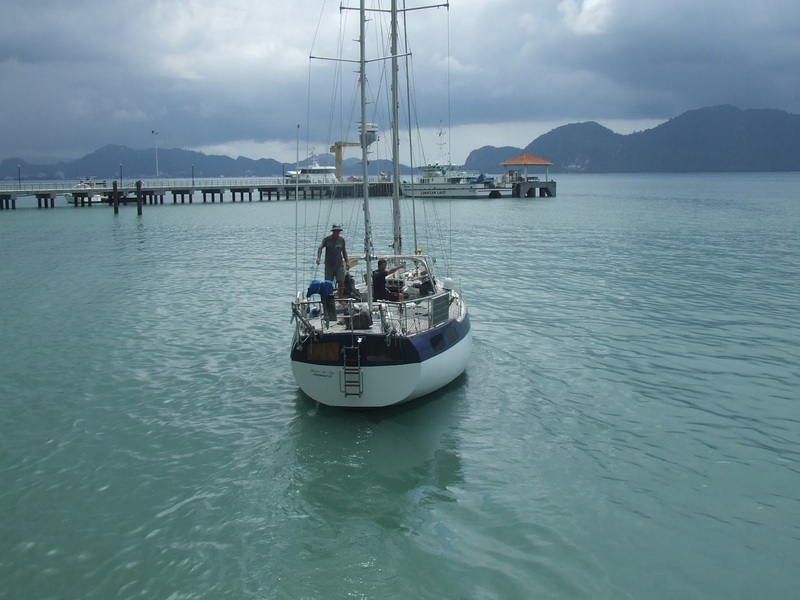 We spent the first night at Pulau Tuba, just around the corner from Langkawi so we could get a head start on the 50 NM (nautical miles) plus leg to Monkey Beach at the north of Penang the next day. It was one of the rolliest anchorages I’ve slept in. Then we started meeting the Fishing Nets. 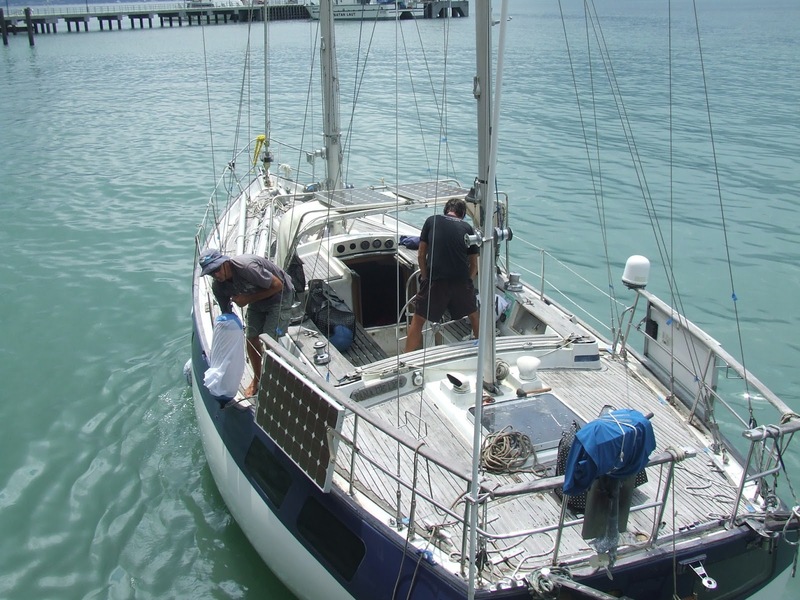 At our second Penang anchorage off Pulau Rimau on the south western tip, the first net, drifting with the tide and current, wrapped around our bows. We were enjoying the happy hour view of the islands and the bridge and all of a sudden the local fisherman had caught our yacht Yana de Lys in their 200 meter long drift net. The fishermen scowled at us when they cut the net off. It happened so quickly there wasn’t time for us stop the capture ourselves. 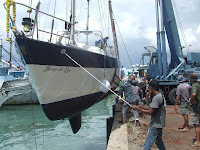 The next day we avoided 87 fishing nets. It was easy enough to figure out how to avoid these nets as they were dragged between two fishing boats. 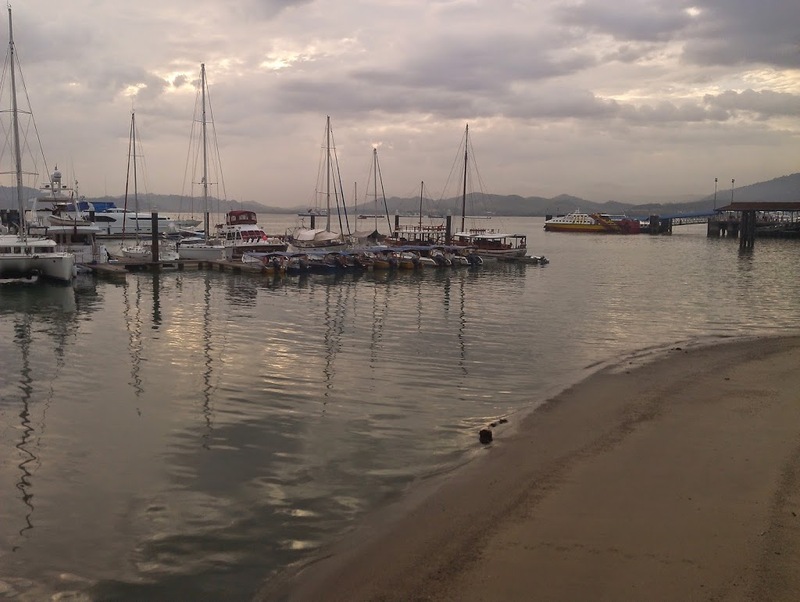 At our deserted, idyllic anchorage that evening we listened to the call to prayer on the radio and, incongruously, to an Australian Football League match. Our team the West Coast Eagles lost. Again. Our course to Lumut was infested with fishing net flags. In shallow water. The trick is to work out which flags go together and if you can’t avoid going over the net in between head for the middle, take the engine out of gear with enough boat speed to propel you forward and hope the net doesn’t end up wrapped around the propeller. Our strategy worked. But it was a slow 15 miles. 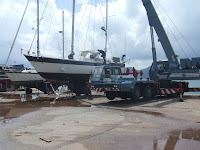 The next anchorage was in front of the Lumut International Yacht Club. Lovely architecture but not exactly what we expect of a yacht club. They didn’t serve food or drink or anything. The call to prayer sounded like a gentle romantic love song. The Lumut boardwalk infrastructure along the river is really pretty, with the most salubrious public toilets I have ever met. The blokes toilet is actually a large aviary. 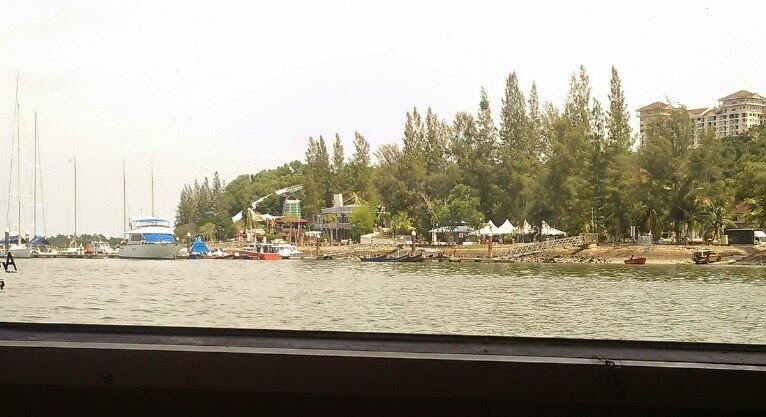 Lumut International Club. Home to seven boats. 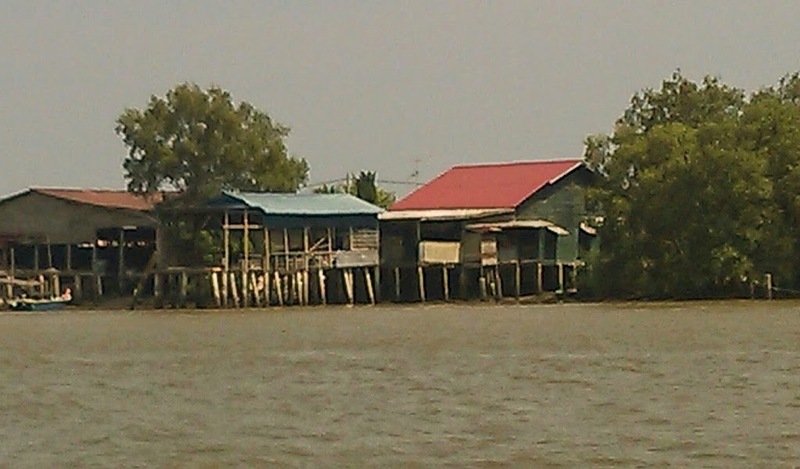 The next stops at Pulau Angsa, Che Mat Sin and Sungei Bernam, where we sort of blended in with other residents of the stilt burbs, were gloriously uneventful. 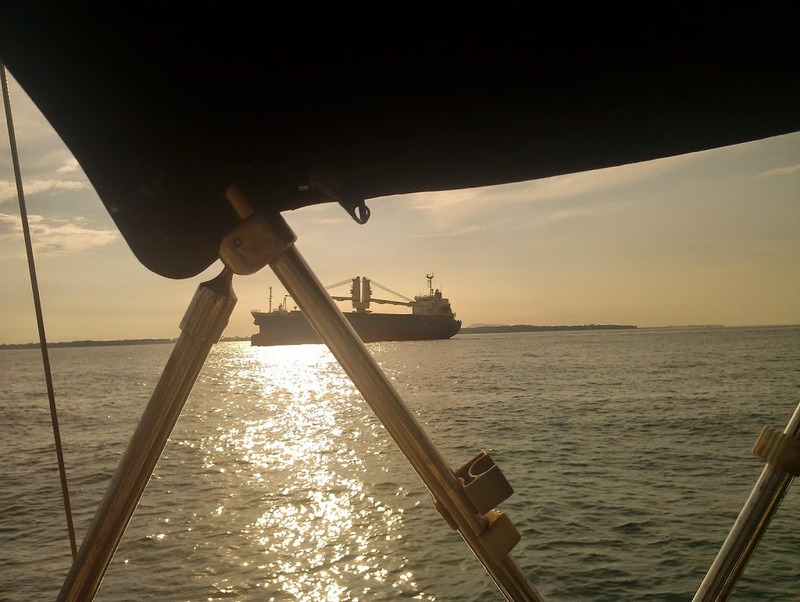 Some sailing blogs make it sound like hardship, but we were getting the hang of this cruising business. 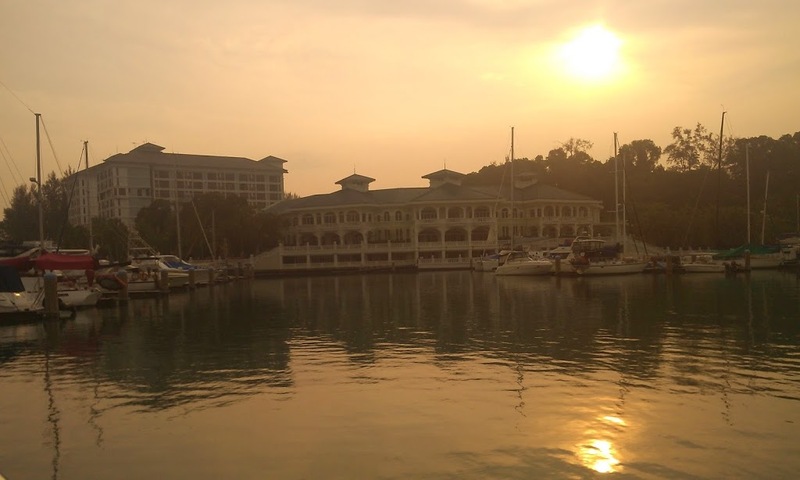 Then we caught our breath at the Admiral Marina at Port Dickson for a few days. All very civilised, resort style. It was our first marina stay after being at anchor for the last three years. When I woke up the first morning with another boat’s mast looming largely right there in my porthole I had a nanosecond of Anchor Angst. Until I remembered where I was and that our anchor hadn’t dragged, but we had deliberately parked this close to another boat. Phew. In Port Dickson we stopped for a beer at an unassuming café and ended up staying and eating and staying even longer absolutely spellbound by the chef constantly cooking a minimum of three high speed wok dishes at once. Like a highly entertaining live cooking show. Live cooking show. It took three staff to keep him stocked with chopped ingredients to fuel his frenzy. On the move again the cargo ship traffic in the Malacca Strait was beginning to build up. 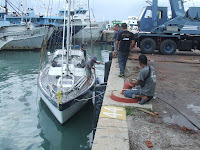 I’ve read sailing blogs about pirates in the Malacca Strait. It’s really the big boats we had to worry about, not pirates. Oh boy. We stayed out of the way of the big boys. We poodled along in the slow lane with a constant stream of varied commercial vessels parading past in the fast lane. Flying fish and dolphins kept speed with us. 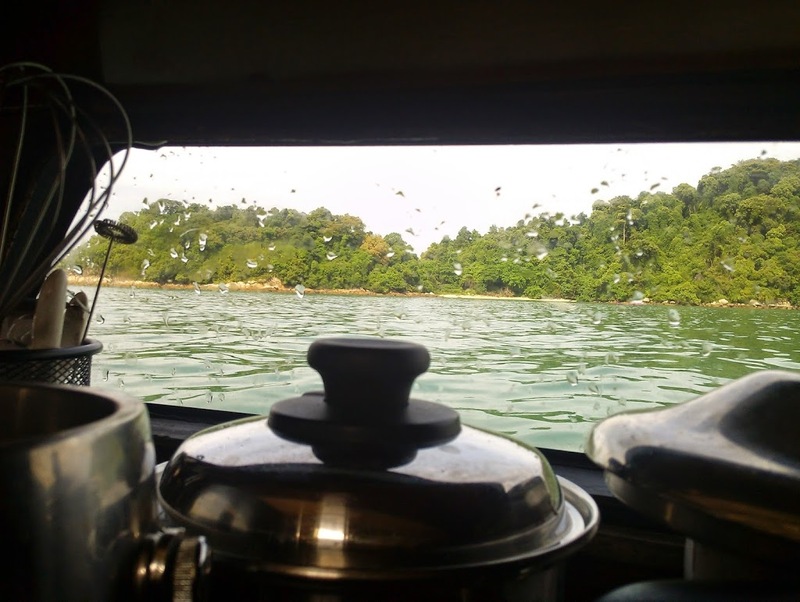 When we had just settled in to a very peaceful anchorage at Pulau Pisang some fishermen came up to us and politely asked us to move. “Boss you move boat boss” indicating the nets they intended to lay out. So, reluctant at first, we moved and were safe for the night. It was different the next night when we were camped in the middle of nowhere out of the way of the shipping lane freeway. We were woken by a loud clunking near the bows to find Yana de Lys well and truly caught in a drifting net with increasing burden on the anchor. With no fishing boats in sight we had no choice but to hack the net off. It came free with a super loud twang. The pressure release was scary. We apologized to the invisible fishermen. The next night we made it to Danga Bay. I’ll tell you all about it in my next sailing blogs. 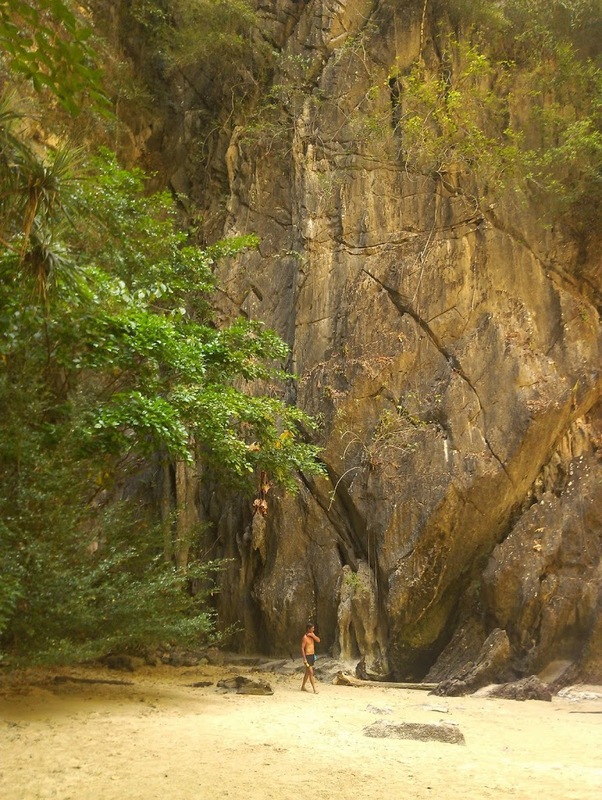 We took a couple of weeks island hopping from Phuket to Langkawi. Some sailors do this trip in 24 hours but that’s just not our style. We’re slow travellers. 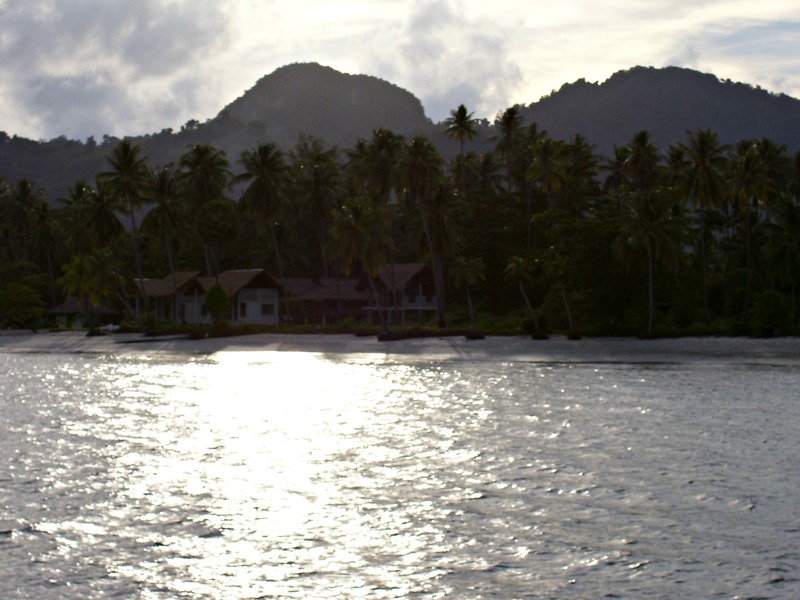 Our first anchorage, Koh Phi Phi (Phi Phi Island) was pleasantly free from crowds. Unlike our last visit when we could hardly move on the island during the day for all the tourists, and there was uber loud doof doof music for the party animals every night. This time the sound track was something so benign I didn’t even remember what it was in the morning. The next leg from Phuket to Langkawi was hard work with 30 knots on the nose on the way to the historic east coast anchorage at Koh Lanta. I decided to give the anchoring way point from our last visit a miss. 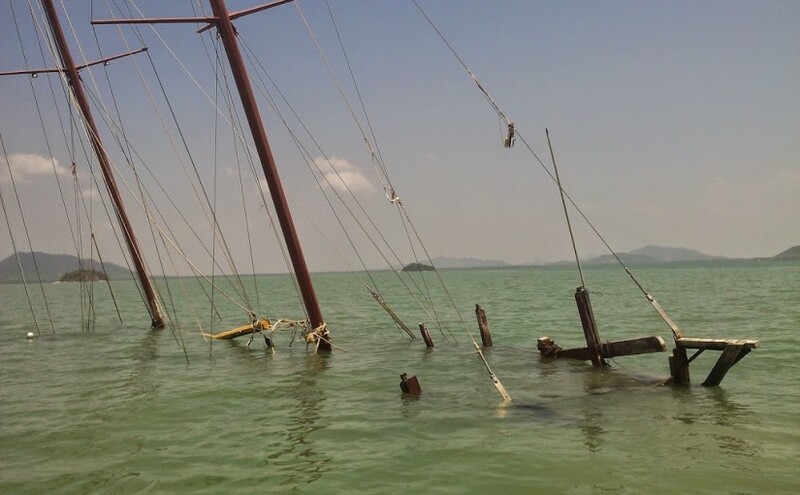 It was being used by a sunken boat. Sunk by politics according to the local intel. 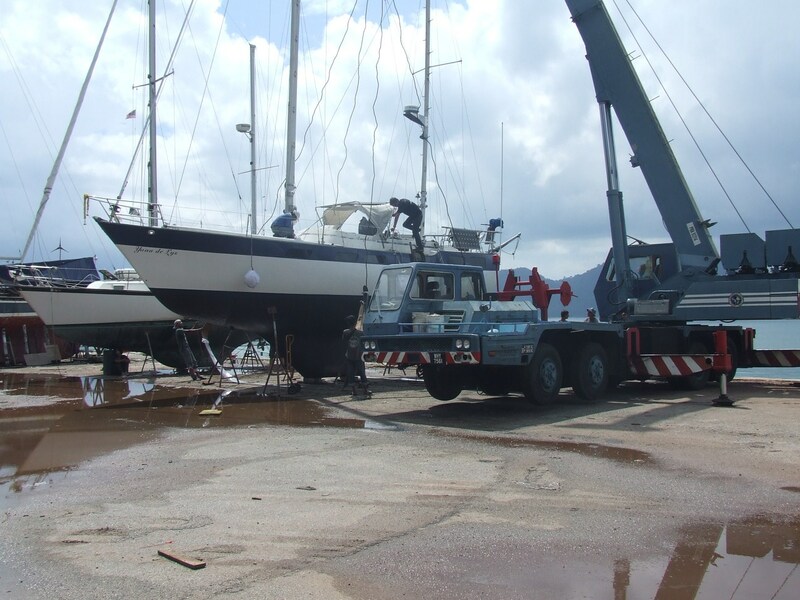 The interested parties couldn’t decide who was supposed to pump the bilge until it was too late. The green prawn curry was just as delicious as I remembered from our first stay. When I asked the staff if the prawns were farmed or wild he articulately pointed out to the sea. 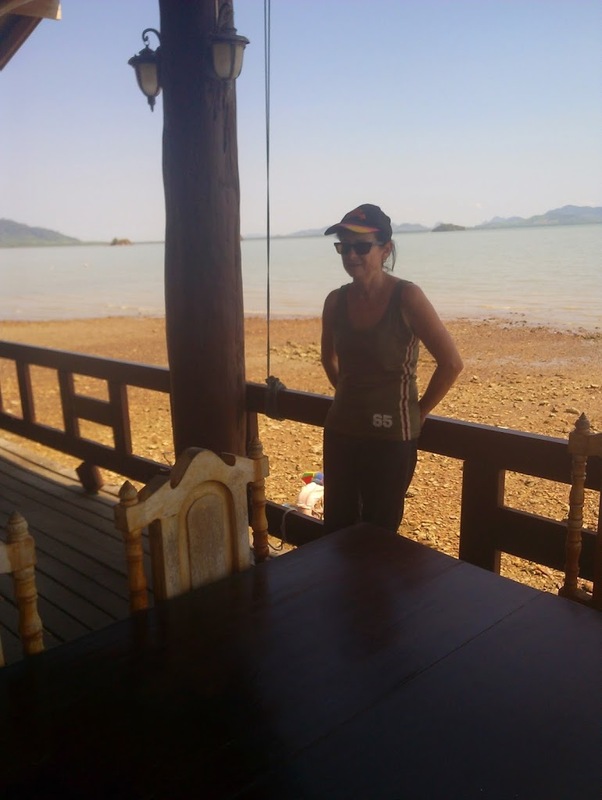 It was an easy run to Koh Muk. At one point I looked out the porthole and saw fish jumping a meter out of the water. Like something out of the film Nemo. The other captain kept telling me about the dolphins he was seeing. All I saw was water disturbances. Hmm. Cruisn. Or is the other captain dolphin spotting? 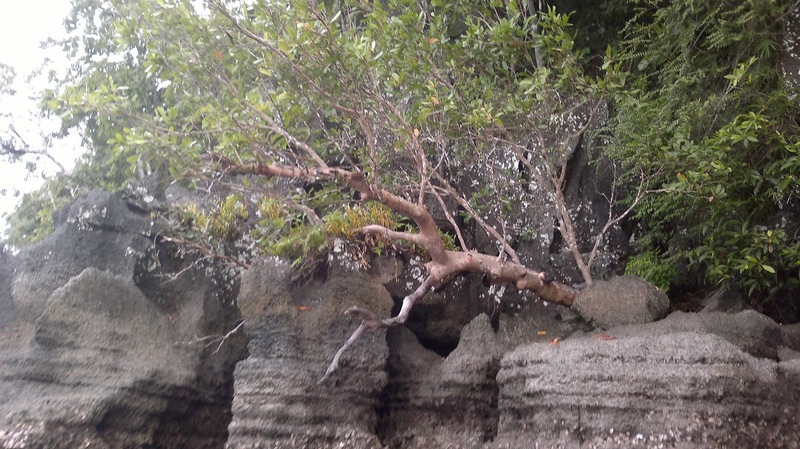 We visited the Emerald Cave on the way to Koh Muk. 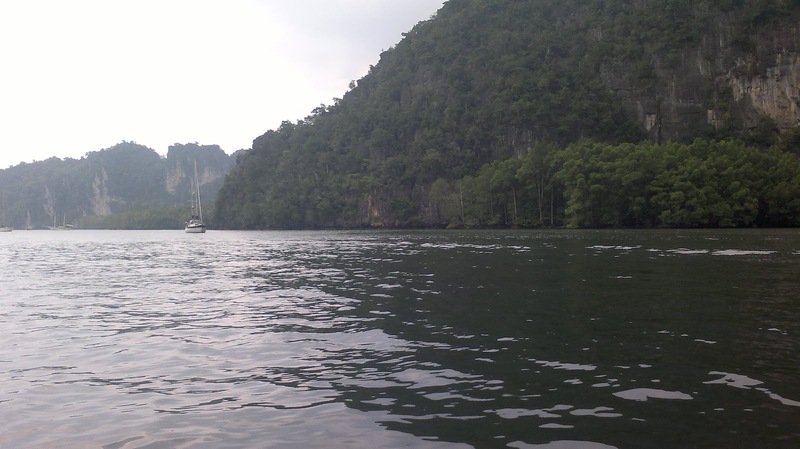 It takes a 70 meter swim through a dark cave to get into the sea cave or “hong” as the Thais call it. Our waterproof torch ended up being allergic to water. On the way back out we realised we had taken a wrong turn. We had to back up in the pitch dark. Maybe that was the way to the fabled pirate treasure. We wouldn’t have found it with a dead torch anyway. We took our time slowly heading south down Koh Taratao. 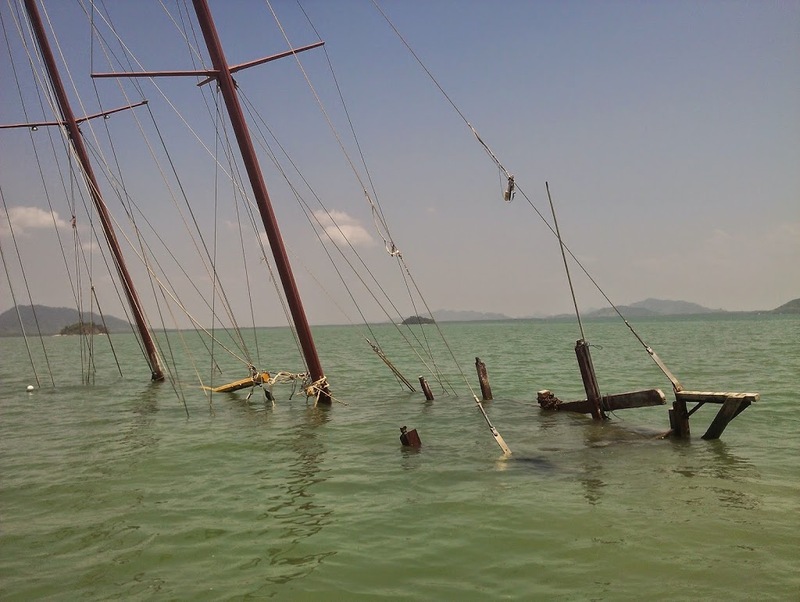 I guess we didn’t want our cruise from Phuket to Langkawi to end. We stopped at three different overnight anchorages. Did some of exploring. Had a bit of stormy weather. One day we took the dingy for a look up one of the rivers. Out of the corner of my eye I thought I saw a dog swimming. It was a sea otter. We heard the last of the Thai radio we’ll be hearing for a while, because suddenly, it seemed, we were in Malaysia again. Oh. Is that what they want us to be cautious of? 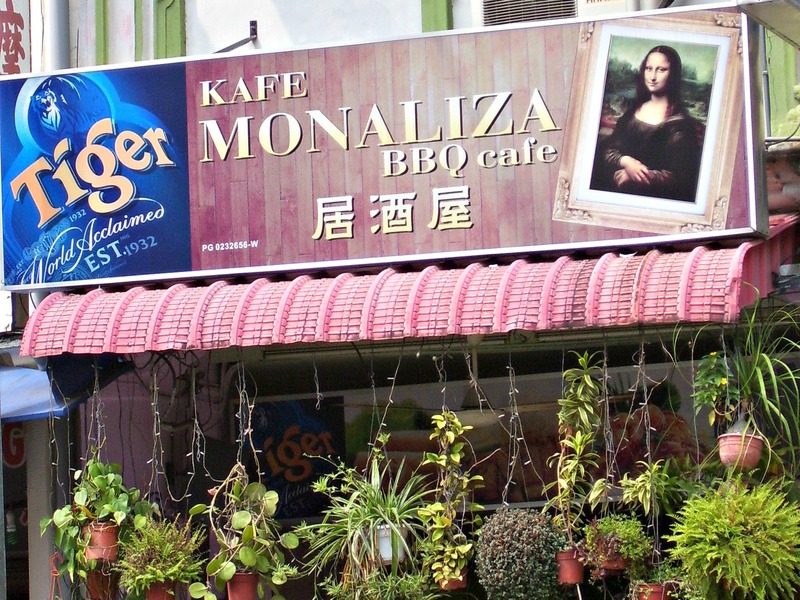 Langkawi is a time vortex. Like the Hotel California you can check-out any time you like, but you can never leave. We planned to say a few days. We were there for a month. And of course consuming and stocking up on the duty free grog. And catching up with old friends. And making new ones. And provisioning for our next leg. Naturally the shopping had to include pork espionage. On a Moslem island they do sell this forbidden product but it requires being in the know. You have to go into the back room of a shop selling spices. Quietly – I thought the proprietor was telling us not to wake the baby – to choose your cloak and dagger snaggers. They were yummy too. 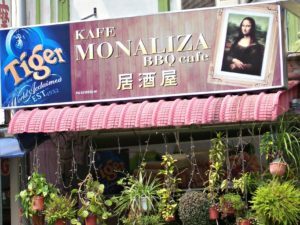 Sausages and mash for dinner at our first anchorage on the way to Danga Bay. Georgetown is full of funky art and beer joints. 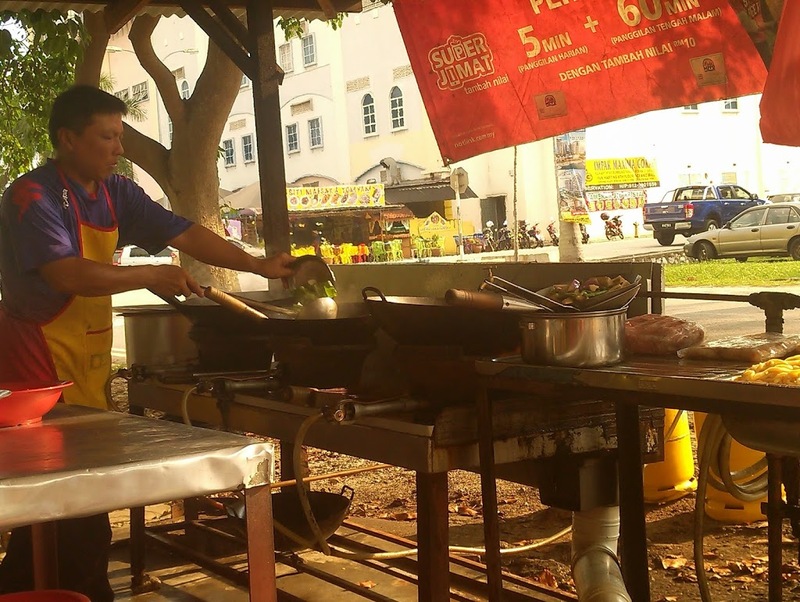 Who needs a reason to visit Penang? 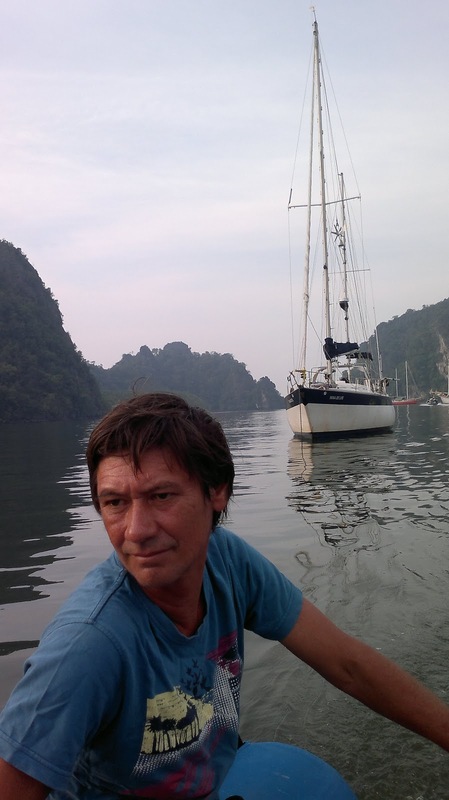 Living in Phuket, we often heard the expats talking about visa runs. Because typically you only get a 30 day visa on arrival in Thailand. We stayed two years (mainly fixing Yana de Lys). Which meant we decided to visit Penang in Malaysia a few times so we could sort out extended visas with the embassy there. I decided we would take a look at the Cheong Fatt Tze Mansion after walking past it so many times on our visits to the Red Garden. I’d heard you have to book in advance so headed off on our first morning to organise tickets while the other captain did some serious TV time in the room. As it happened we didn’t need to book ahead. I ended up with some time up my sleeve before our lunch date so wandered around Muntri Street and Love Lane checking out some of the cool art galleries and old buildings. 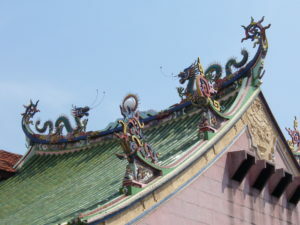 Are they dragons on the roof ? Or is it the patron saint of sailors at the Hainan Temple? I also snuck in a temple visit, spending some velvet devotional time in the Hainan Temple. (The other captain runs a mile when I mention temples.) The building just looked so exquisite from the outside I had to go in. I lit a candle for my beautiful lost wild child – a Catholic ritual in a Chinese temple. (I definitely have catholic tastes when it comes to spirituality and religion.) Later I read in the Lonely Planet the temple’s patron saint is the patron saint of seafarers. No wonder I felt drawn. Our first guided tour. Ever. Anyway for the first time in our travelling careers, we took a guided tour. Well, it is the only way to see inside the Cheong Fatt Tze AKA the Blue Mansion. Our tour guide was excellent, an expert at engaging her audience of some 37 people. She told great stories about the family who built and lived in the mansion, including the original owner’s (favourite) wife number seven. Our guide’s depth of understanding of Chinese culture as well as the architecture, intrinsically linked with Feng Shui, was fascinating. More dragons. Maybe the next Game of Thrones will be filmed here? The Kongsi Clan Temple is as georgeous on the inside as out. 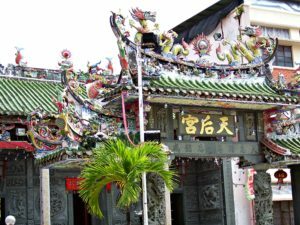 The next morning I felt inspired to continue the theme with a visit to the Cheah Kongsi Clan Temple. The other captain was out buying electrical wire for Yana de Lys God bless him. I was amazed at how the stuff I learnt in the Blue Mansion tour helped me understand and interpret what was going on with the design and history of this gorgeous building. Without a tour guide heh heh. Then we were back in Phuket International Airport with our three month- convertible into six-month visas. (I know it’s complicated. Let’s not go there.) I had to switch back to my basic basic basic Thai. How do people know how to speak multiple languages without getting confused? Finally we left Langkawi in Malaysia after working on Yana de Lys for two years. 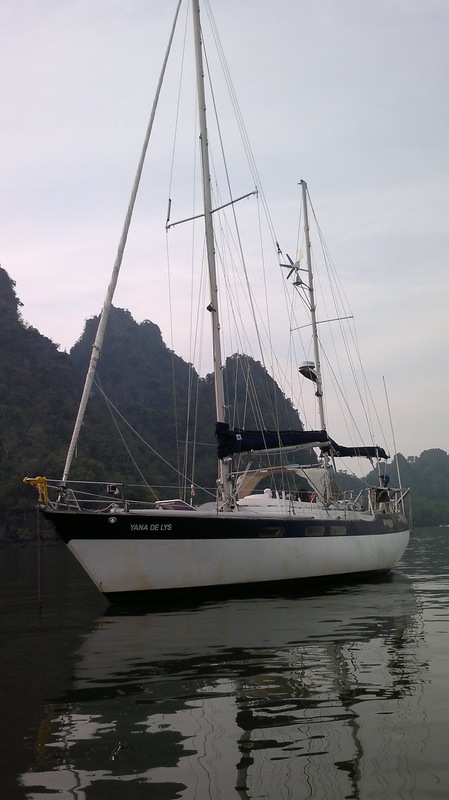 It was kinda late in the sailing season for a sailing trip to Thailand. Were we too impatient? Was Yana ready? What could possibly go wrong? We were going to sail to Phuket in easy stages, with safe anchorages planned along the way in case the weather hit the fan. Well it wasn’t the weather which hit the fan it was the drive shaft. After two nights of blissful anchorages, I was thinking this is why we have a boat. That two years of hard work was worth it after all. Perky the engine was purring and I felt I could trust her to motor all 120 NM (nautical miles) if we ended up with no wind to help us. 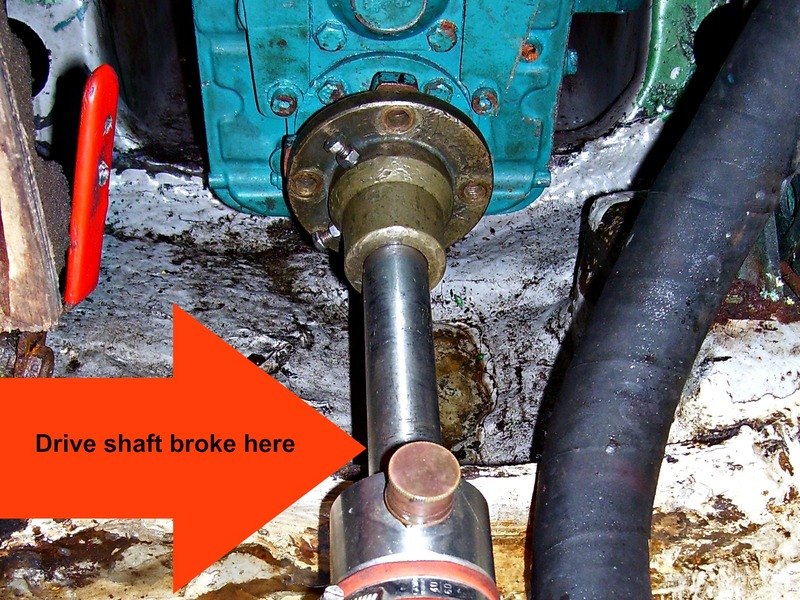 Then at around 9 am on Day 3 of our tropical island sailing trip, 20 NM north of Taratao Island the drive shaft snapped, right at the end where it meets the gearbox. 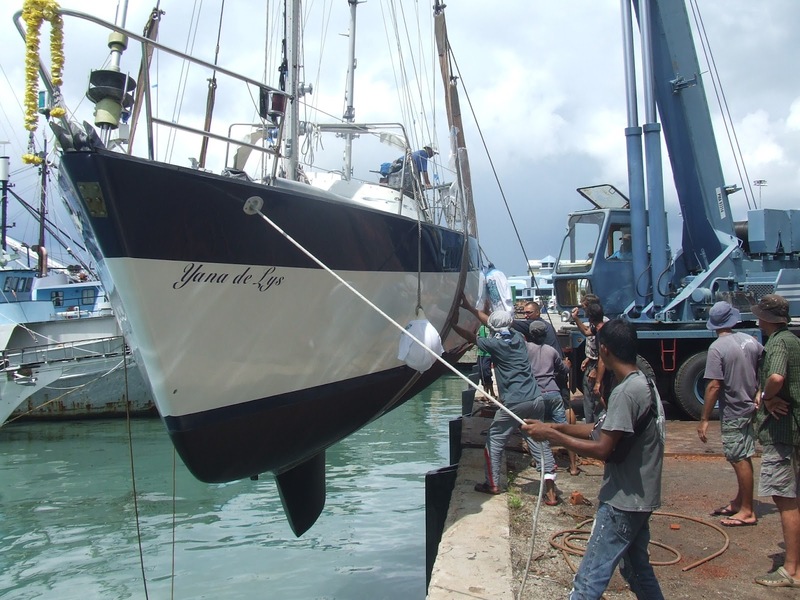 No way we could jury rig a fix on board, alone in the water. We started sailing north in about 3 knots of wind (from the north!). We tacked for three or four hours between Ko Phetra and Ko Tului Noi making less one than mile progress. Then the wind picked up but it was still pretty well in the direction we wanted to go until we began heading for Ko Talebong. 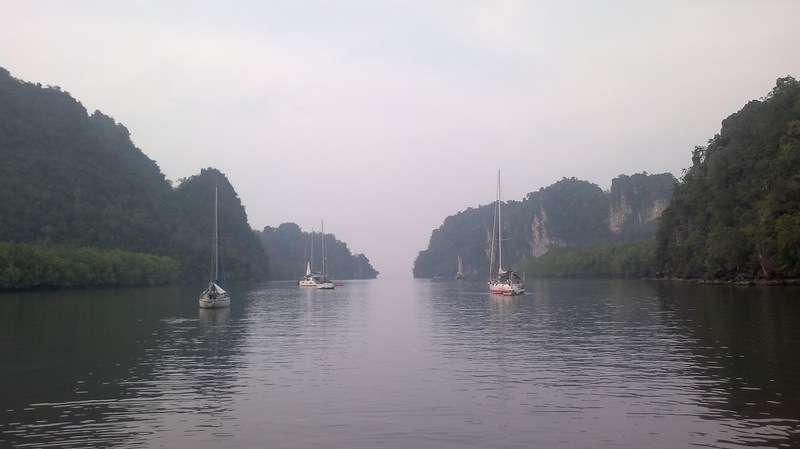 It was hairy passing those rocky outcrops at the SW end of Ko Talebong, close hauled in the moonless dark. 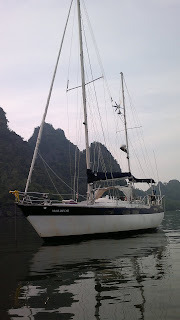 But we finally made it to a safe anchorage at Ko Muk by 11 pm, despite the fact the only night sailing we’d ever done was in our TAFE Yachtmaster courses and we’d never anchored without using the engine before. 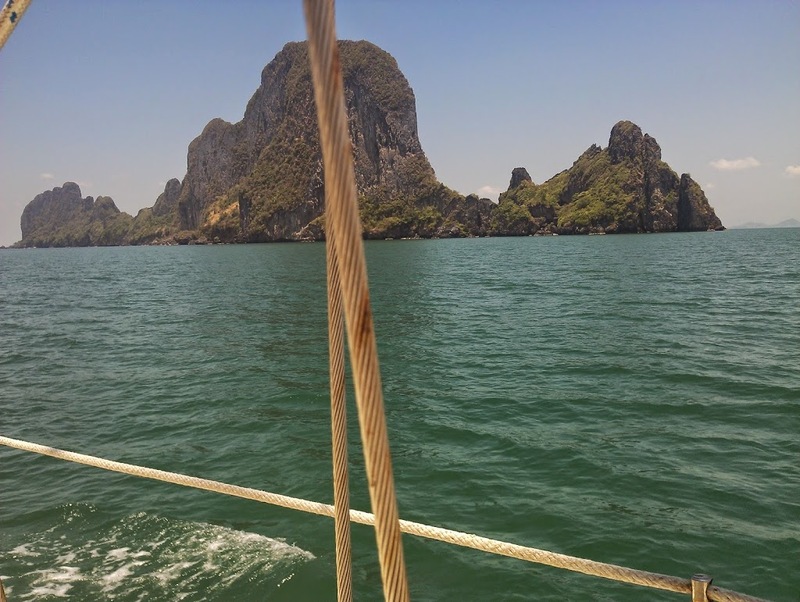 You can read more about how this sailing trip got better, then got worse, and how we finally made it to Phuket six weeks later, in the Stranded in Paradise blogs. 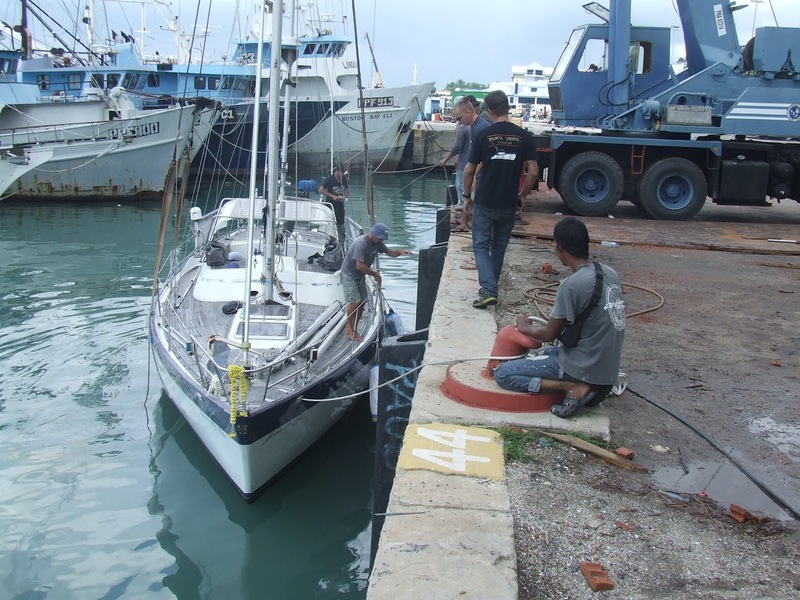 Posted on 14/05/2012 06/06/2016 Categories Malaysia, Sailing adventure, Stranded in Paradise, Thailand, Yacht maintenanceTags Ko MukLeave a comment on What Could Possibly Go Wrong? We left Australia in March after replenishing the anorexic bank accounts and returned to Langwaki where we lived in a room above our favourite lunch spot, the Watergarden Hawkers Centre and finished some work on Yana de Lys on the hard stand. And finally relaunched with brand new standing rigging, clear see through windows, freshly painted topsides, a lot less leaks, new engine mounts, LED light tricolour and anchor light and a myriad more improvements. Still a lot to do, but at least she’s floating again. 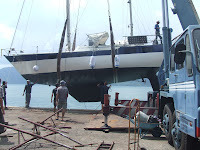 The plan is to sail to Phuket and finish Yana so we can focus on cruising after that. It’s been fun living in Kuah. Our room came with one TV station – A National Geographic channel which seemed to have The Dog Whisperer on a continual loop. I saw a Bollywood movie shoot, and one car crash out the window . No one was hurt in the crash, just a bit of mangled metal and lot of walking around in circles by both parties. And occasionally I heard all the taxi drivers over the road shouting. That meant another tourist was driving the wrong way up the one way street. 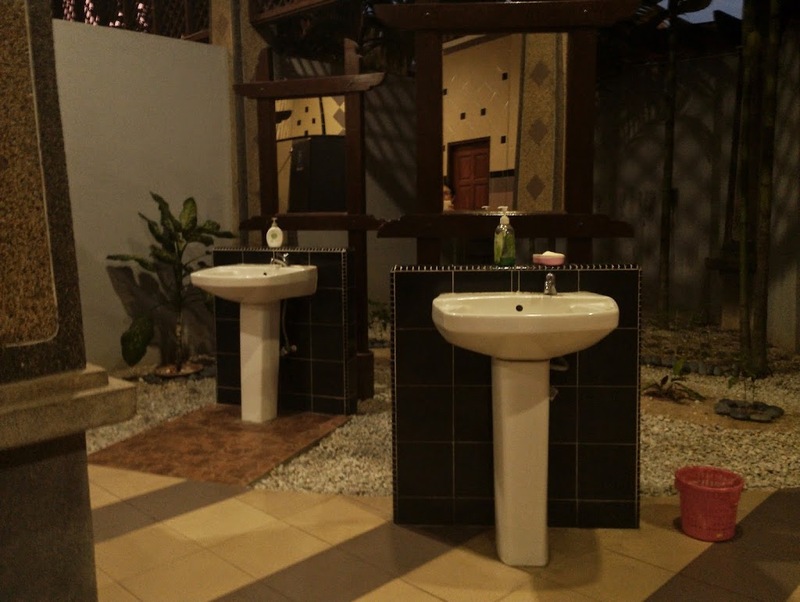 I treated myself to an Ayurvedic massage in Pentai Cenang at one point. The Njaravkizhi treatment was described as a relaxing massage in the brochure, but I did find it a bit hard to relax while I was being bashed by bags of hot rice. 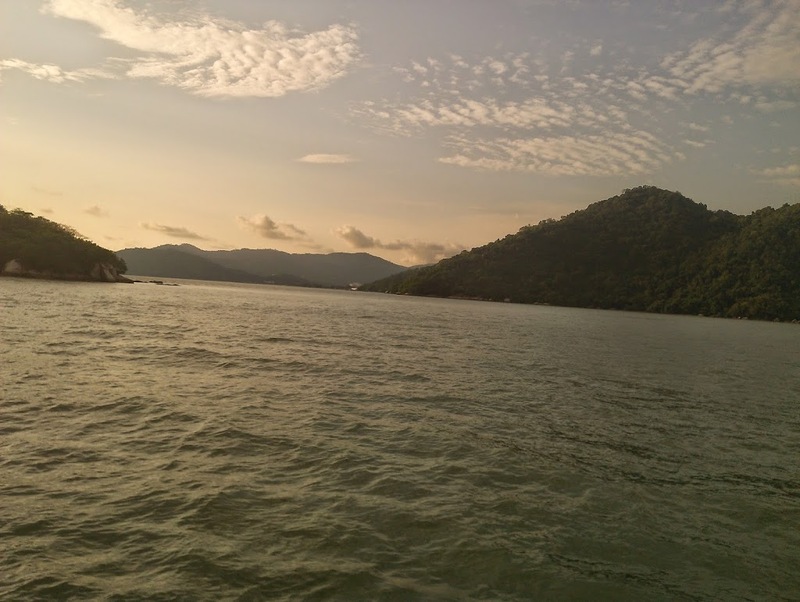 We took the ferry to Penang for three days so we could get our extended Thai visas. 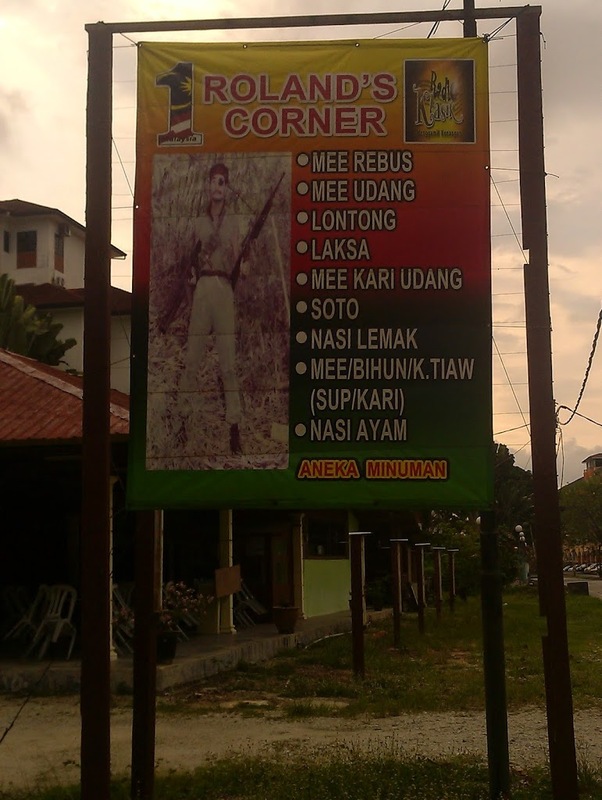 I love Penang. The food at the Red Garden is sensational. 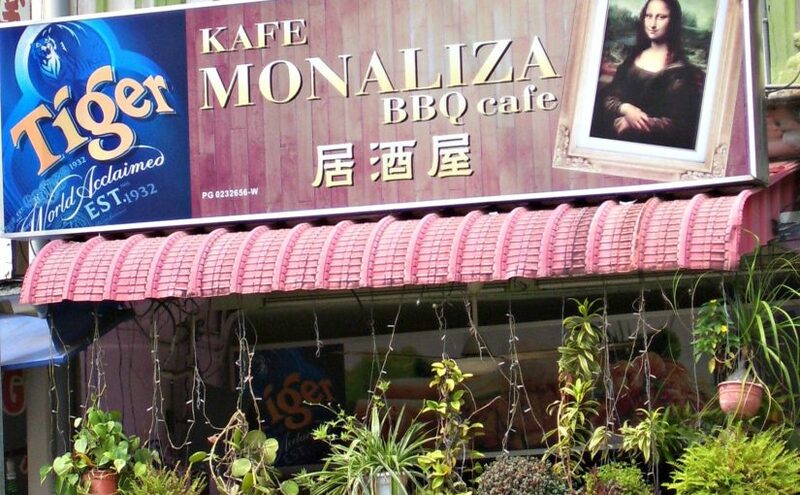 We ate there every night, even though we tried to talk ourselves into trying somewhere else. We lost track of how many times we got lost shopping for items for Yana de Lys which weren’t available in Langkawi. 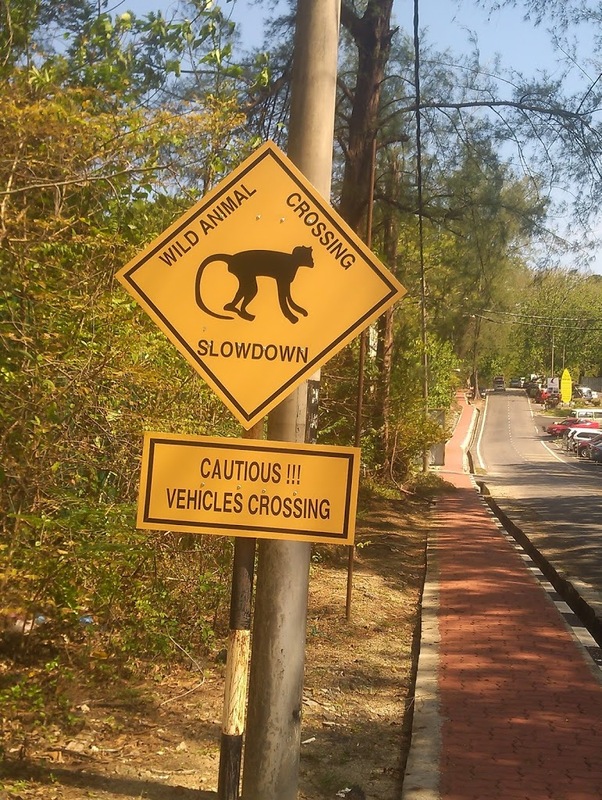 On the third day we decided to play tourists and hire a scooter to check out the Funicular rail at Penang Hill. It feels like you’re going up vertically. And when you get to the top the views are sensational. I felt like I could see all of Malaysia, while we drank the most expensive beer of our whole trip. Meanwhile back in Langkawi we loaded Yana with provisions in readiness for our our trip to Phuket. The Hole in the Wall seen from the Kilim River. The entrance is almost impossible to spot from the ocean. 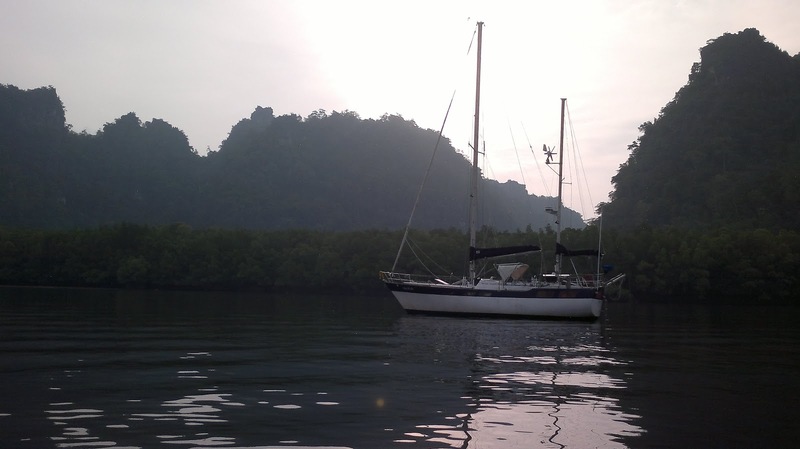 Continuing on we rounded the eastern corner of Langkawi to arrive at the Hole in the Wall anchorage on the north coast, at the mouth of the Kilim River. 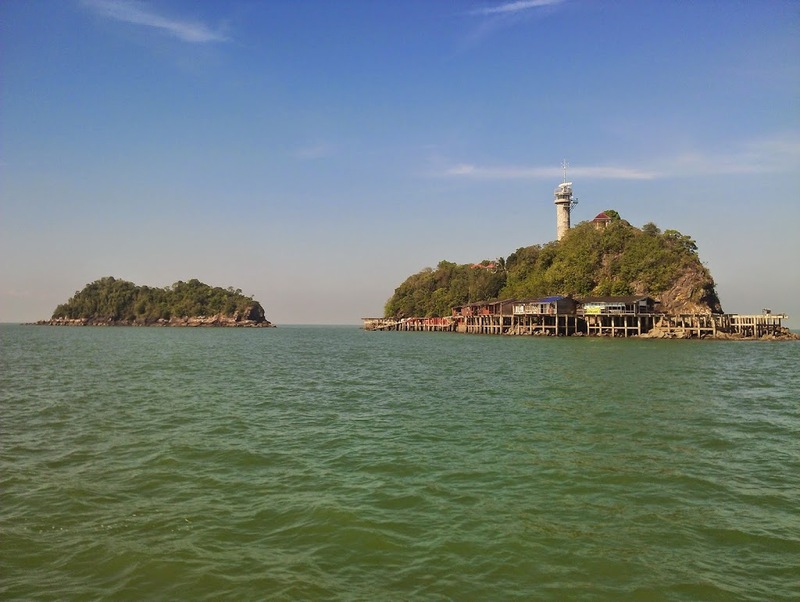 Apparently this is where the pirates used to hide out before Langkawi was settled. 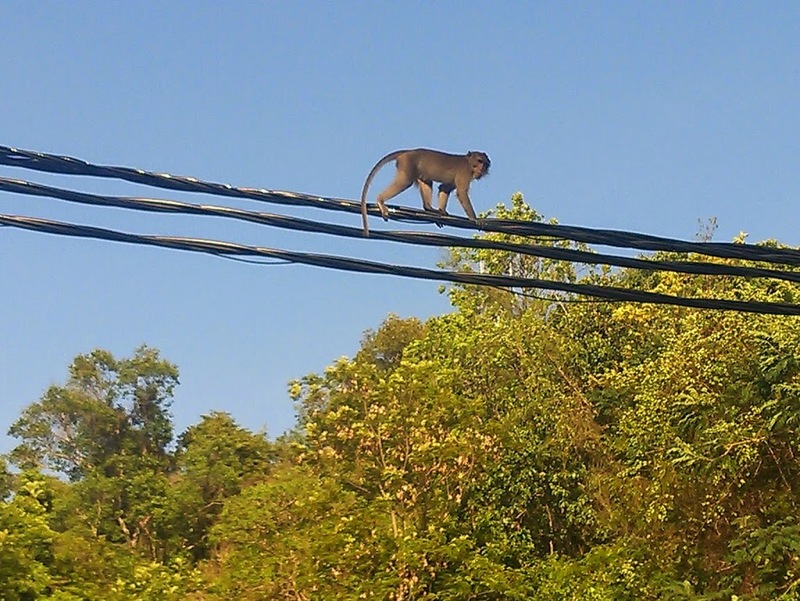 There are monkeys in the mangroves and lots of monitors swimming in the river. Around one bend I counted 14 sea eagles feeding. We visited the Gua Kelawar (Bat Cave). At the end we realised we hadn’t seen any bats though, so we started again from the beginning, and there they were, hundreds, maybe thousands of the cute little critters hanging up right at the entrance. 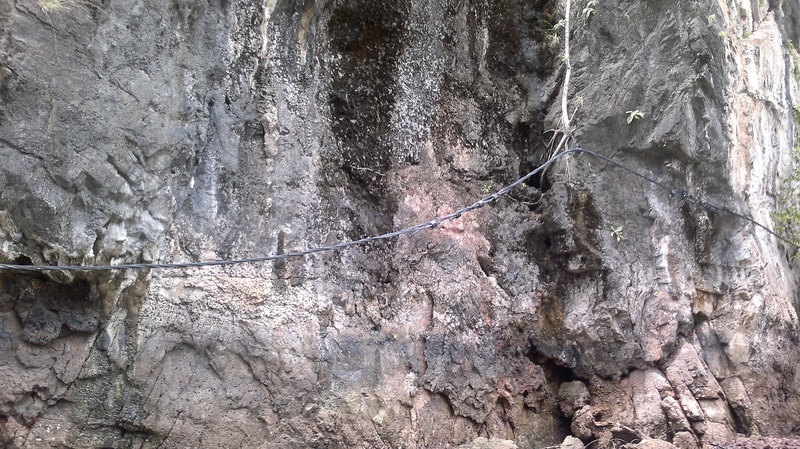 We’d been too busy marvelling at the stalactites and stalagmites to notice them before LOL. There are a couple of fish farms and a floating restaurant just round the corner from our anchorage. When we dropped in to the restaurant for refreshments, Rod asked for a couple of Tiger beers to begin with. “No thank you sir, we only have Skol” was the waitress’s terminally polite reply. Those places get their electricity via cables which snake through the mangroves and over the limestone karsts to a jetty about 20 minutes by tender down the river. At high tide some of the lines hang in the water.